A mature Amiga emulation package is UAE and today most (all?) 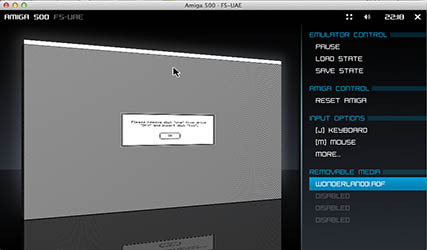 Amiga emulators that are activly maintained are based on UAE. While the original UAE development seems to have stopped, there is the Windows port WinUAE which seems to be the most feature-packed version today and there are several more or less active descendants. A very nice multi platform fork of WinUAE is called FS-UAE. 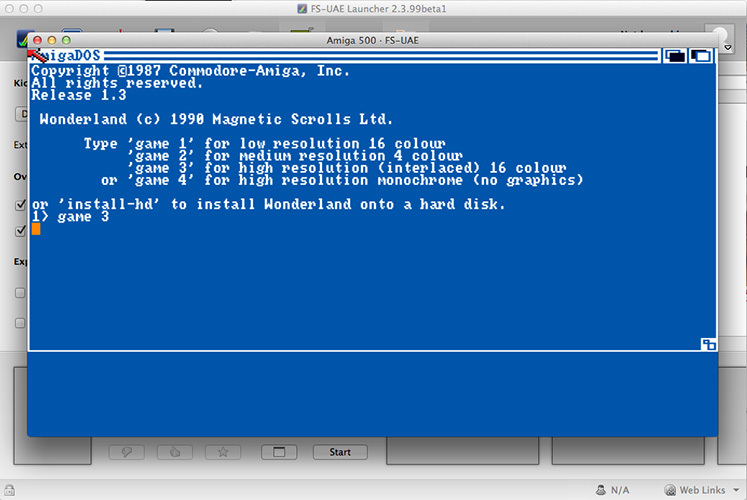 It is not as advanced as WinUAE, but has everything you need for playing the Magnetic Scrolls games and runs on all major platforms. This guide will show how to set up FS-UAE, but setting up WinUAE should be very similiar. 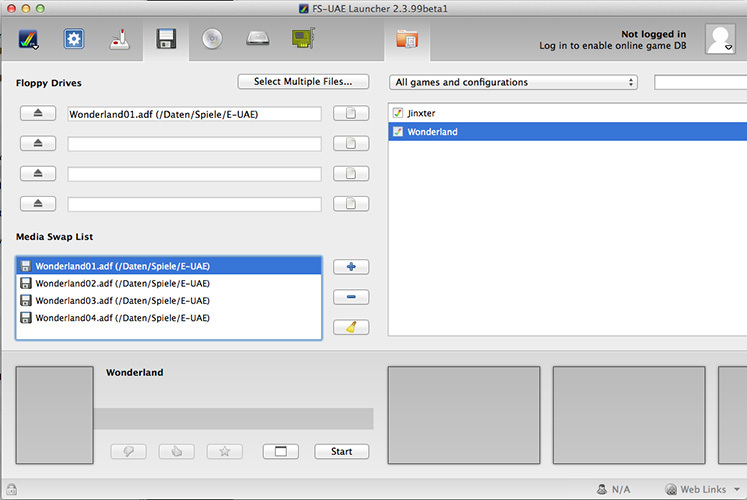 Like most other emulators, FS-UAE uses images files containing the contents of the original game disks. 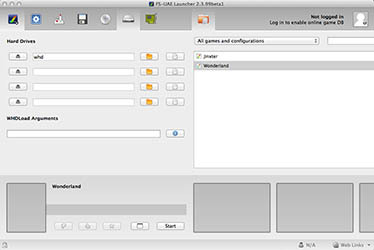 The image files normally have the file extension adf. 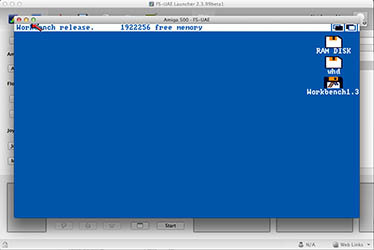 If you are trying to preserve your original disks as accurate as possible, you might need files with the extension ipf. Fortunately, these are supportd by FS-UAE out of the box. 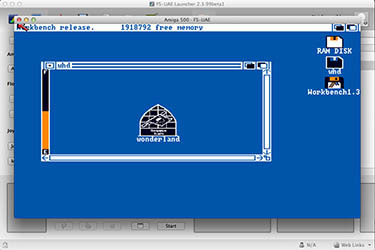 To create adf images there are several options, some of them require original Amiga hardware, some try to read Amiga disks directly from PC floppy drives (doing some magic). A good overview to the available options finds here. 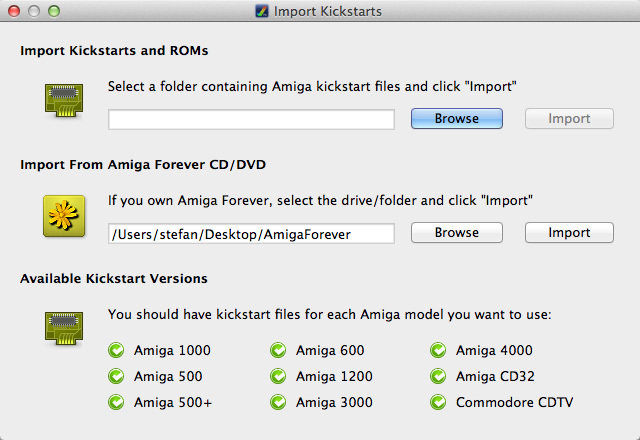 I myself read my Amiga disks with the full version of disk2fdi without problems. Of course, you could also try your luck in the internet. As long as you have an original package of the game, downloading an image should be ok. 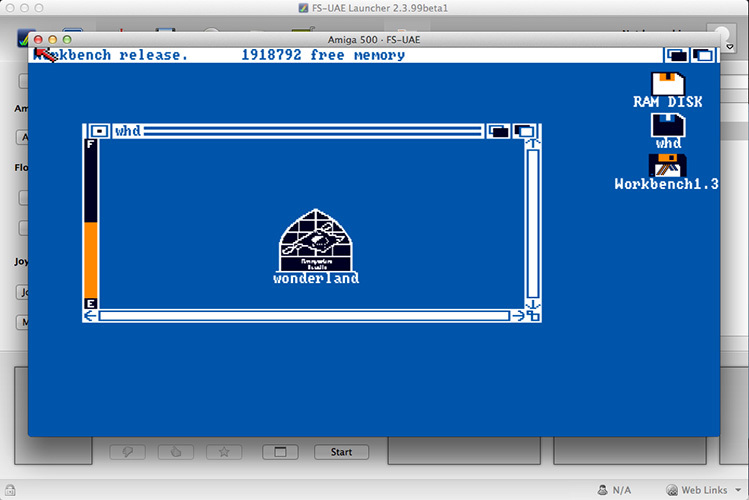 The emulator requires a least a so called Kickstart system ROM. 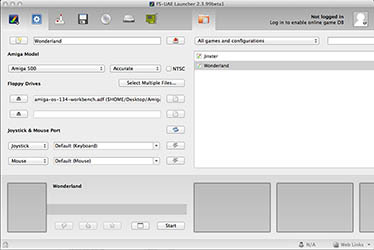 To really work with the emulator and for example install games onto an emulated hard drive, you will also need a so called Workbench disk. All the Magnetic Scrolls game work with Kickstart 1.3. 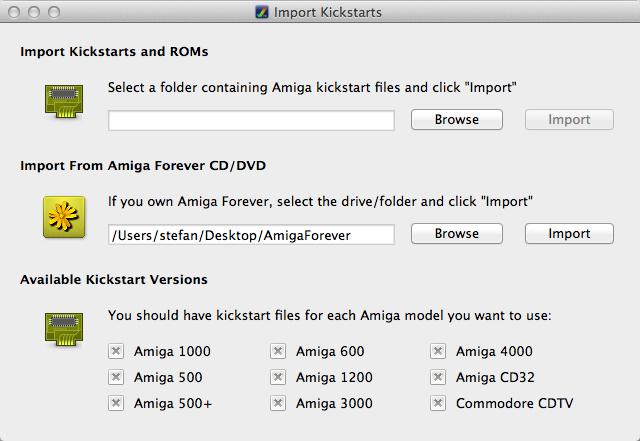 If you still have a working Amiga, you can dump the ROM and workbench disks to image files directly on your Amiga. The required tools and a guide are available here. 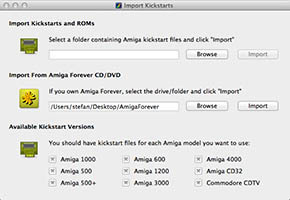 If you don't have your Amiga anymore or would be happy to get ready-to-use image files, fortunately these can be bought legally from Cloanto. The smallest package called Value edition is available for about 10 Euro and includes Kickstart 1.3 and Workbench 1.3. 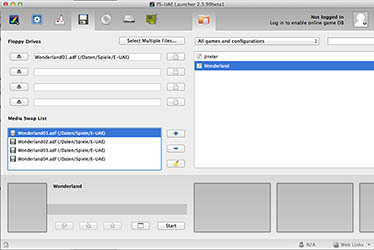 Occasionally, some of the ROMs are contained on computer magazine DVDs, e.g. issue 26/2013 of the german magazine c't had the Value Edition included. 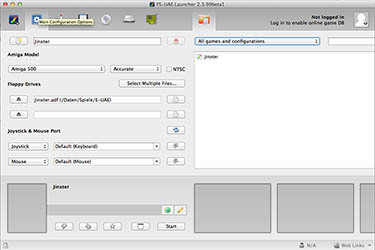 Finally save your configuration and start the emulator. 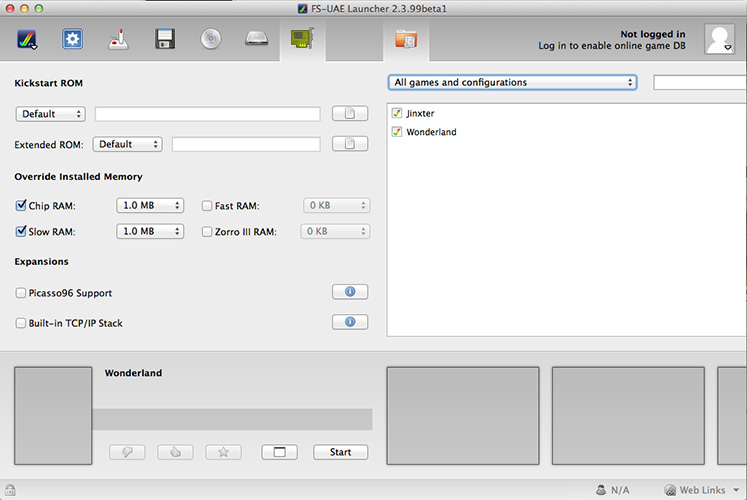 After while you should see the following screen which asks for one of four possible game configurations to start. 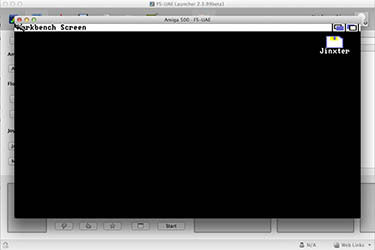 These configurations differ in screen resolution and colour depth. 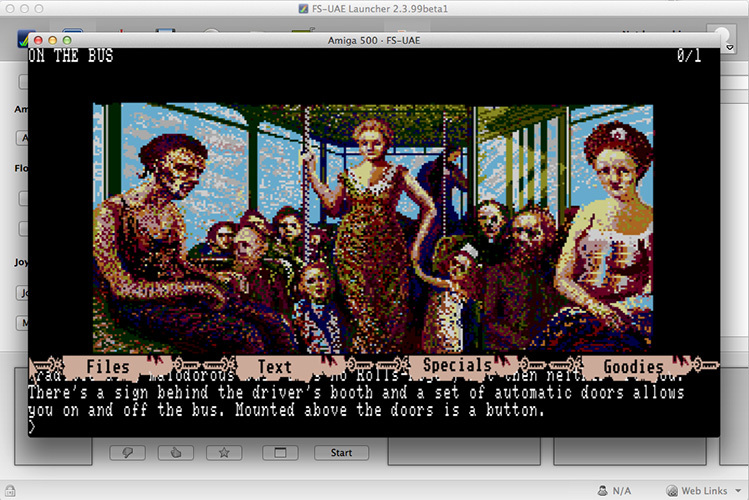 To start the game in high resolution with 16 colour graphics type "game 3" and press Enter. And there you go. For a better gaming experience I highly recommend running the multi-disk games from a virtual hard disk. 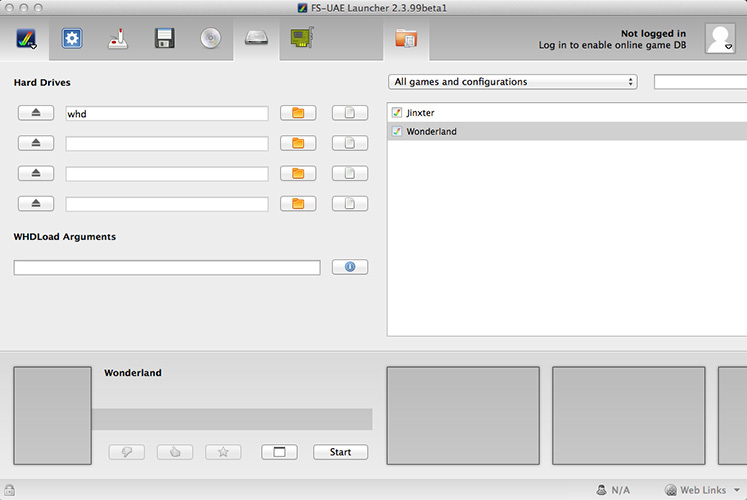 Please refer to the hint section below for installing Wonderland or the Collection onto HD. And just in case you did not notice: Have you tried the full screen mode? 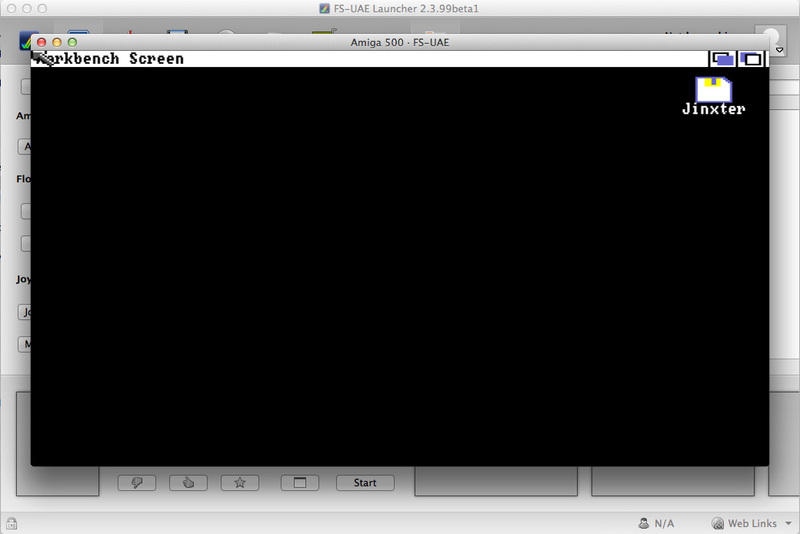 To release the mouse cursor from the emulation window press the alt key and the left mouse button. 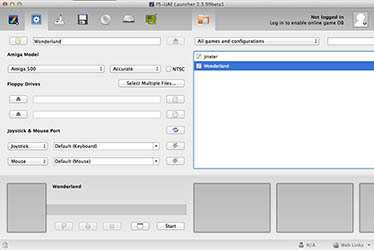 If you are using an Apple keyboard you might encounter the problem that most FS-UAE keyboard shortcuts are firmly bound to the F12 key, however this key has special system functions attached (volume control) and never gets through to FS-UAE. While there are mentioned some alternative keyboard shortcuts on the FS-UAE support pages, none of them worked with my Yosemite system. If you have this problem as well, you might consider one of the following workarounds: The simple one is: disable the special functions in the system control panel. 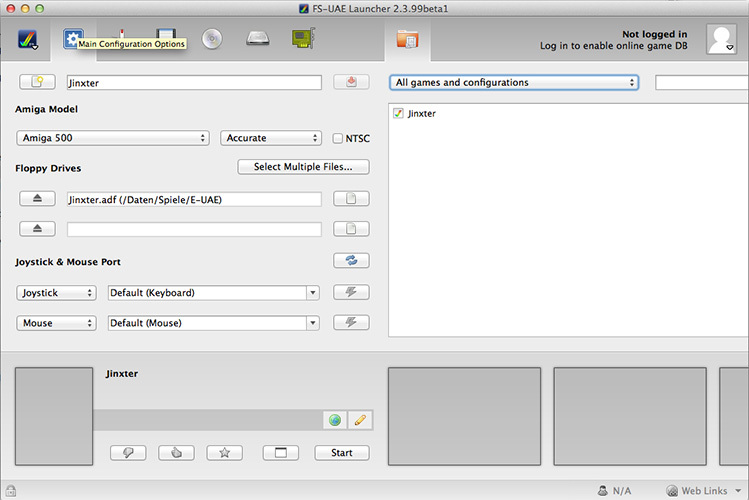 You should have something like "Use the F keys as default function keys" in the system control panel for the keyboard. Since I never used the special functions this was my preferred solution. 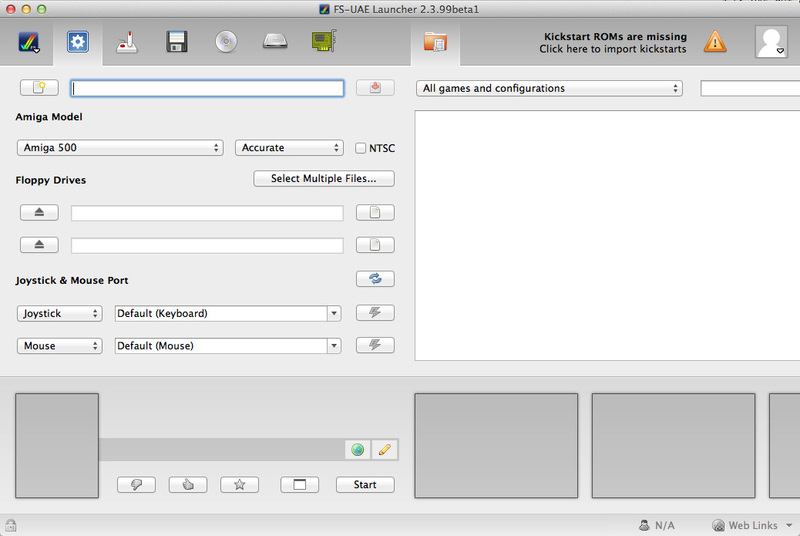 The fancy one: If you use the special keys frequently, perhaps you want to take a look at Karabiner. It is possible to run the hd install with the latest version of the now discontinued E-UAE (8.29-WIP4) and a small trick. E-UAE also supports mounting a native directory as hard disk and the emulator reports back the actual free space on the native drive. Considering the GB or TB you have on modern computers, the free space that is reported to the installer is way too large and causes number overflows. To circumvent this problem, I created a writable dmg file under OSX with the size of 20MB (yes, MB!) 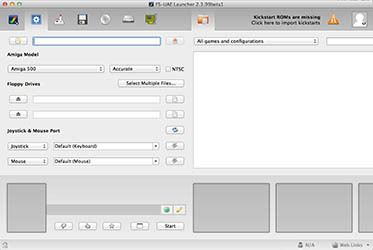 and mounted a directory from this image file and then indeed, the installer tool gets the correct free space on the image file. Unfortunately this little trick doesn't work with FS-UAE, but to make it less painfull, you can find archive files containing the installed hard disk files for easy mounting in FS-UAE. 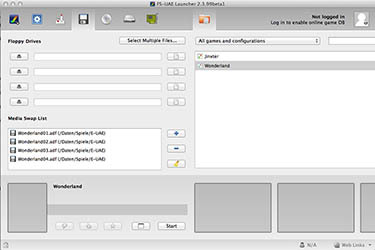 Note: The installer also offers to store the game graphics compressed or decompressed on the hard disk. All the above archives have the graphics decompressed. 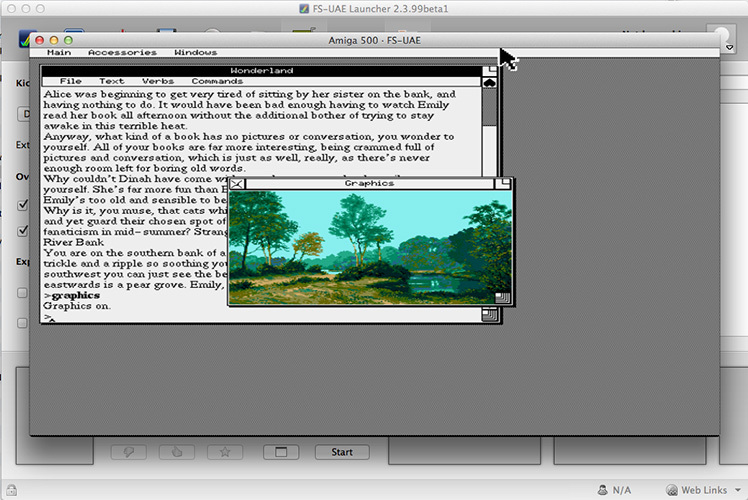 The archives provided above are configured to run on device dh0. 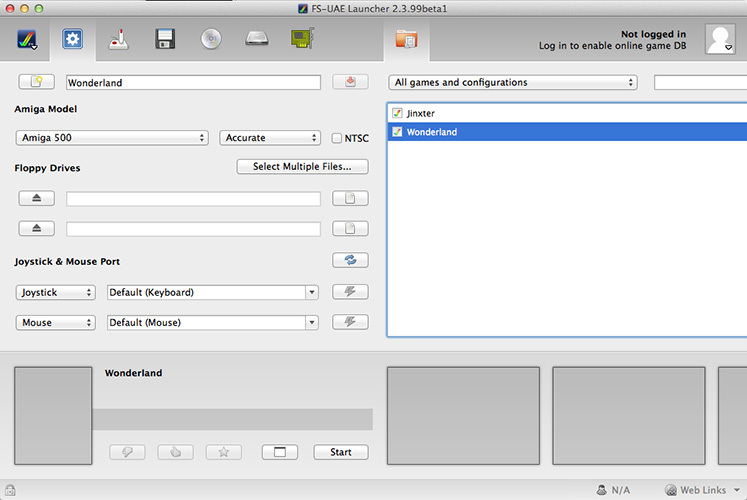 However, if you want to run the game from a different HD or move the game to a different folder, it is easy to adapt: All you need to do is opening all the files with the extension *.rdf in a text editor and change the path names. If you want to run the game in a game mode other than the one you downloaded, there is no need to download a new archive and go through all the configuration stuff, again. 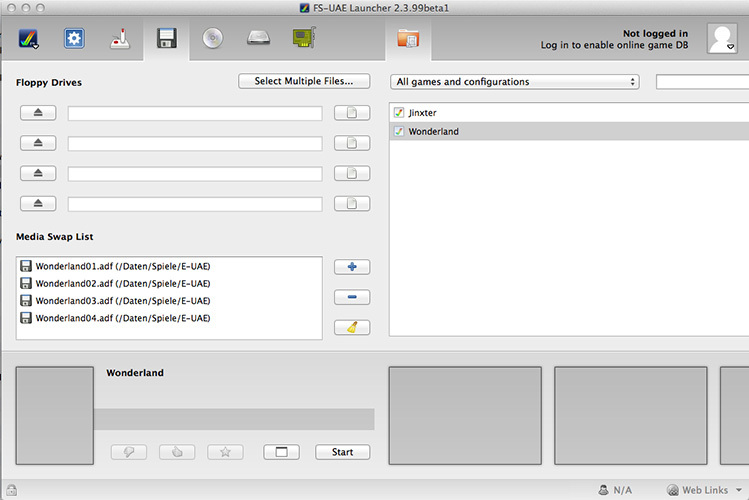 Instead you can open the file args located in the Wonderland folder in a text editor and simply replace the number with your new choice.